The smile you’ve dreamed of is waiting for you! Using modern technology and materials designed to look, feel, and perform naturally, Brookside Dental Care can help you achieve a smile worthy of the silver screen with innovative cosmetic dentistry. Schedule your consultation with us today to discover what our cosmetic solutions can do for you! Beautiful smiles begin with a strong foundation of optimal oral health. Teeth and gums free of infection or decay are essential factors for ensuring the best results from cosmetic services. A thorough examination of your oral health and professional cleaning is necessary before receiving any cosmetic treatments for enhancing your smile’s beauty. Once optimal oral health is achieved, we create a cosmetic treatment plan that enhances the best features of your smile. If ignored, gum disease will only get worse until gum tissues recede, and tooth loss becomes a risk. Missing teeth not only affect the appeal of your smile, but the lack of stimulation from healthy tooth roots weakens the jawbone and can result in sunken or prematurely-aged facial features. Poor chewing due to tooth loss can also cause digestive issues. If you suspect you may have gum disease or are suffering from loose or missing teeth, contact our team today to discover what cosmetic options can restore your smile’s beauty, function, and health! A bright, radiant smile not only makes for lasting impressions but also suggests ideal oral health. As one of the most popular services of cosmetic dental care, professional teeth whitening is a great way to improve your smile quickly and safely. What Causes Teeth to Become Stained in the First Place? Because your smile is in constant use, enamel discoloration is often inevitable. When highly pigmented foods and drinks, such as dark berries, red wine, coffee, tomatoes, and soda are consumed, the color attaches to the surfaces of your teeth. Stains can penetrate past the enamel, causing persistent discoloration which often cannot be removed by over-the-counter products. 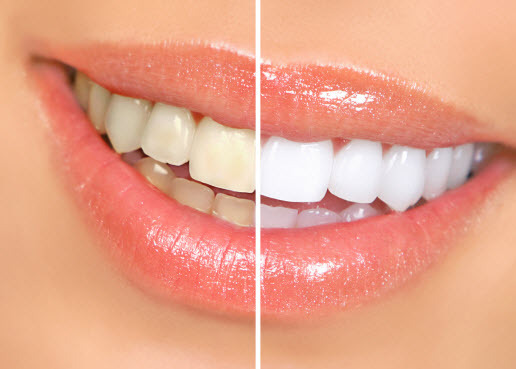 In-Office Teeth Whitening - Chairside teeth whitening offers can enhance your smile by several shades within a single visit. Regular dental cleaning before your treatment is recommended for the best results. The complete procedure typically takes less than an hour, depending on your level of tooth discoloration. Take-Home Solution Teeth Whitening - For those with schedules that make it difficult to receive teeth whitening at our office, we provide complete convenience with take-home kits, including trays crafted to fit your smile perfectly. With this option, you have complete control of when and where you wish to lighten your teeth. Professional whitening treatment offers numerous benefits that you typically can’t get from drugstore products. Professional teeth whitening is ideal for almost any lifestyle. Are you getting ready for a big social event? Does your busy schedule keep you out of the dental chair? Whatever your situation, there’s a perfect teeth whitening solution for you. Teeth whitening paired with other cosmetic dentistry treatments provides a truly comprehensive approach to enhancing your smile. Lots of kids get braces to help straighten out their teeth, which helps their smiles look good. But did you know that straighter smiles are also much healthier? Less tooth decay – Straight teeth are easier to clean. Better digestion – An even bite makes chewing more effective, which helps digestion. Less wear on teeth – Braces keep uneven chewing from wearing down teeth prematurely. Fewer accidents – Straighter teeth are less likely to be damaged by an accident or injury. Better confidence – When your teeth look good, you’re able to smile more freely. How is Invisalign® Different from Metal Braces? Invisalign® clear braces use a series of custom clear aligners to guide your teeth into proper alignment gradually. While metal braces shift teeth through tension, Invisalign uses targeted pressure to move them. The aligner trays are slimmer and designed to fit snugly against your teeth. They’re also removable and can be taken out for eating or brushing your teeth. Both Invisalign and traditional braces are designed to shift your teeth into the best possible alignment. While they use different methods, both work well for mild and moderate cases. However, Invisalign may be less effective for overbites, underbites, and severe misalignment. Whether Invisalign or traditional braces are the best choices depends on your unique dental structure. Our dentist will talk with you about your alignment issues, and what it will take to fix them, so you can make an informed choice about your treatment. Invisalign offers several benefits you can enjoy while you straighten your teeth. Discreet: The clear aligners are almost invisible to anyone looking at your smile. Comfortable: The aligners are custom-made to fit against your teeth with nothing poking out. Safe: With no metal bits, there’s less risk of injury during sports and other activities. Do you have questions about Invisalign? You aren’t alone! Many people want to know more! Here’s what people are asking about Invisalign. How Long Does Treatment Take? It depends on your unique case. Invisalign treatment can take anywhere from 6-18 months, wearing each tray for two weeks. Some patients can accelerate treatment by changing trays every week. Talk to the dentist to determine if this may be an option for you. How Much Do I Have to Wear the Aligners? You’ll need to wear the trays for at least 22 hours every day during your treatment. It’s recommended to wear them whenever you aren’t eating a meal or brushing your teeth. Is Invisalign Painful? Since your teeth are moving, it’s common with any orthodontic process for teeth to be sensitive after getting an adjustment or switching to a new aligner. For most people, the soreness only lasts a few days, after which your teeth feel normal again. Does It Affect My Speech? It can take a little time for your tongue to get used to the added thickness of the aligners on your teeth, which can have mild effects on your speech. Once you get used to the aligners, any affectations should go away on their own. Does Invisalign Limit What You Can Eat? Not at all! Since you remove the aligners to eat, you can eat whatever foods you like. You will need to brush your teeth afterward and make sure you wear the aligners for the full 22 hours a day. Most people find that they eat fewer snacks while using Invisalign. Can I Kiss with Invisalign? Definitely! It’s almost impossible for others to tell you’re wearing Invisalign without looking very closely. Since they’re custom-fitted to your teeth, kissing while wearing it is no different from kissing normally. Can I Smoke with Invisalign? We recommend that you refrain from smoking during your treatment. Tobacco stains the aligners, making your teeth appear yellow or brown. It also increases your risk of gum disease, which negatively impacts your treatment and can lead to bone and tooth loss. At Brookside Dental Care we offer advanced treatment options for all your cosmetic dental needs. Contact us today and schedule a comprehensive evaluation. We can help you achieve a confident, healthy smile!